Option #1: An eye-catching Bouquet including the 22" Baby Boy Airplanes Bubble Balloon, and Six-18" solid colour foils attached to a Foil Weight, $33. Option #2: An eye-catching Bouquet including the 22" Baby Boy Airplanes Bubble Balloon, Three-18" Themed Baby Boy Foils, Eight-11" decorator and solid colour latex balloons attached to a Foil Weight, $39. 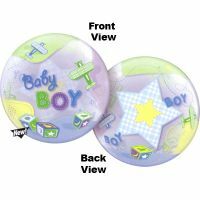 Option #3: An eye-catching Bouquet including the 22" Baby Boy Airplanes Bubble Balloon, Three-18" Themed Baby Boy Foils, Six-18" solid colour foil balloons attached to a Foil Weight, $47. Option #4: An eye-catching Bouquet including the 22" Baby Boy Airplanes Bubble Balloon, Three-18" Themed Baby Boy Foils, a Dozen-11" decorator and solid colour latex balloons attached to an 8-10" plush animal, or basketful of jelly beans and cookies, $54.